"Union Pacific" redirects here. For other uses, see Union Pacific (disambiguation). Union Pacific Railroad (reporting mark UP) (or legally Union Pacific Railroad Company and simply Union Pacific) is a freight hauling railroad that operates 8,500 locomotives over 32,100 route-miles in 23 states west of Chicago and New Orleans. The Union Pacific Railroad system is the second largest in the United States after the BNSF Railway and is one of the world's largest transportation companies. The Union Pacific Railroad is the principal operating company of the Union Pacific Corporation (NYSE: UNP); both are headquartered in Omaha, Nebraska. Union Pacific is known for pioneering multiple innovative locomotives, typically the most powerful of their era. These include members of the Challenger-type (such as the 3985, the 3977), and the Northern-type (the 844), as well as the famous Big Boy steam locomotives (including the 4014). Union Pacific ordered the first (diesel) streamliner, the largest fleet of turbine-electric locomotives in the world, and still owns the largest operational diesel locomotive. The Union Pacific legacy began in 1862 with the original company, called the Union Pacific Rail Road, which was part of the First Transcontinental Railroad project, later known as the Overland Route. The railroad would subsequently be reorganized thrice: as the Union Pacific Railway (which absorbed the original in 1880), as the Union Pacific "Railroad" (which absorbed the Union Pacific Railway in 1897), and finally as a renamed Southern Pacific Transportation Company (which merged with Union Pacific in 1998). The current Union Pacific corporation began in 1969 as the Southern Pacific Transportation Company, which was itself created in a reorganization of a railroad whose legacy dated to 1865. Over the years it would grow to include (among others) the Denver and Rio Grande Western Railroad and the St. Louis Southwestern Railway, in addition to its eponymous railroad. The 1998 Union Pacific-Southern Pacific merger was not UP's first: Union Pacific had already merged with Missouri Pacific Railroad, the Chicago and North Western Transportation Company, the Western Pacific Railroad and the Missouri–Kansas–Texas Railroad. However, because the merger with Southern Pacific substantially changed the scope of the Union Pacific railroad, this article will refer to the unmerged system as Union Pacific (Mark I), and the merged system as Union Pacific (Mark II). Union Pacific (Mark II)'s main competitor is the BNSF Railway, the nation's largest freight railroad by volume, which also primarily services the Continental U.S. west of the Mississippi River. Together, the two railroads have a duopoly on all transcontinental freight rail lines in the U.S. The original company, the Union Pacific Rail Road was incorporated on July 1, 1862, under an act of Congress entitled Pacific Railroad Act of 1862. The act was approved by President Abraham Lincoln, and it provided for the construction of railroads from the Missouri River to the Pacific as a war measure for the preservation of the Union. It was constructed westward from Council Bluffs, Iowa to meet the Central Pacific Railroad line, which was constructed eastward from Sacramento, CA. The combined Union Pacific-Central Pacific line became known as the First Transcontinental Railroad and later the Overland Route. The line was constructed primarily by Irish labor who had learned their craft during the recent Civil War. Under the guidance of its dominant stockholder Dr. Thomas Clark Durant, the namesake of the city of Durant, Iowa, the first rails were laid in Omaha. The two lines were joined together at Promontory Summit, Utah, 53 miles (85 km) west of Ogden on May 10, 1869, hence creating the first transcontinental railroad in North America. Subsequently, the UP purchased three Mormon-built roads: the Utah Central Railroad extending south from Ogden to Salt Lake City, the Utah Southern Railroad extending south from Salt Lake City into the Utah Valley, and the Utah Northern Railroad extending north from Ogden into Idaho. Directors of the Union Pacific Railroad gather on the 100th meridian, which later became Cozad, Nebraska, approximately 250 miles (400 km) west of Omaha, Nebraska Territory, in October 1866. The train in the background awaits the party of Eastern capitalists, newspapermen, and other prominent figures invited by the railroad executives. The original UP was entangled in the Crédit Mobilier scandal, exposed in 1872. As detailed by The Sun, Union Pacific's largest construction company, Crédit Mobilier, had overcharged Union Pacific; these costs had then been passed on to the United States government. In order to convince the federal government to accept the increased costs, Crédit Mobilier had bribed congressmen. Although the UP corporation itself was not guilty of any misdeeds, prominent UP board members (including Durant) had been involved in the scheme. The ensuing financial crisis of 1873 led to a credit crunch, but not bankruptcy. As boom followed bust, the Union Pacific continued to expand. The original company was purchased by a new company on January 24, 1880, with dominant stockholder Jay Gould. Gould already owned the Kansas Pacific (originally called the Union Pacific, Eastern Division, though in essence a separate railroad), and sought to merge it with UP. Thusly was the original "Union Pacific Rail Road" transformed into "Union Pacific Railway." Extending towards the Pacific Northwest, Union Pacific built or purchased local lines that gave it access to Portland, Oregon. Towards Colorado, it built the Union Pacific, Denver and Gulf Railway: both narrow gauge trackage into the heart of the Rockies and a standard gauge line that ran south from Denver, across New Mexico, and into Texas. The Union Pacific Railway would later declare bankruptcy during the Panic of 1893. Again, a new Union Pacific "Railroad" was formed and Union Pacific "Railway" merged into the new corporation. In the early 20th century, Union Pacific's focus shifted from expansion to internal improvement. Recognizing that farmers in the Central and Salinas Valleys of California grew produce far in excess of local markets, Union Pacific worked with its rival Southern Pacific to develop a rail-based transport system that was not vulnerable to spoilage. These efforts came culminated in the 1906 founding of Pacific Fruit Express, soon to be the world's largest lessee of refrigerated railcars. Meanwhile, Union Pacific worked to construct a faster, and more direct substitute for the original climb to Promontory Point. In 1904, the Lucin cutoff opened, reducing curvature and grades. The original route would eventually be stripped of track in 1942 to provide war scrap. To attract customers during the Great Depression, Union Pacific's chairman W. Averell Harriman simultaneously sought to "spruce up" the quality of its rolling stock and to make its unique locations more desirable travel destinations. The first effort resulted in the purchase of the first streamlined train: the M-10000. The latter resulted in the Sun Valley ski resort in central Idaho; it opened in 1936 and finally was sold in 1964. Despite the fact that the M-10000 and its successors were among the first diesel locomotives, Union Pacific completed dieselization relatively late. In 1944, UP finally received delivery of its last steam locomotive: Union Pacific 844. As the 20th century waned, Union Pacific recognized — like most railroads — that remaining a regional road could only lead to bankruptcy. At the close of December 31, 1925, UP and its subsidiaries had operated 9,834 route-miles and 15,265 track-miles; in 1980, these numbers had remained roughly constant (9,266 route-miles and 15,647 track-miles). But in 1982, UP acquired the Missouri Pacific and Western Pacific railroads, and 1988, the Missouri–Kansas–Texas. By 1993, Union Pacific had doubled its system to 17,835 route-miles. By the same token, few large (class I) railroads remained. The same year that Union Pacific merged with the Chicago and North Western (1995), Burlington Northern and ATSF announced plans to merge. The impending BNSF amalgamation would leave one mega-railroad in control of the west. In order to compete, UP quickly merged with Southern Pacific, thereby incorporating D&RGW and Cotton Belt, and forming a duopoly in the West. Although Southern Pacific was the nominal survivor, the merged railroad took the Union Pacific name. The Union Pacific system includes hundreds of yards. The majority of those yards are flat yards — used for local switching. Other types of yards include intermodal terminals and hump yards. Intermodal terminals are typically ports, but UP also has terminals inland for trucks, such as a $90 million terminal in San Antonio that opened in 2009. Union Pacific #9214, a GE Dash 8-40C, shows the standard UP diesel locomotive livery on May 10, 1991. UP's basic paint scheme for its diesel-electric locomotives is the oldest still in use by a major railroad. The middle two-thirds of the locomotive body is painted Armour Yellow, so named because it was the color used by the Armour meat company. A thin band of Signal Red divides this from the Harbor Mist Gray (a fairly light gray) used for the body and roof above that point. Signal Red is also painted at the bottom of the locomotive body, but this color has gradually become yellow as new Federal Railroad Administration (FRA) regulations for reflectorized tape came into effect in 2005; the trucks, underframe, fuel tanks and everything else beneath that line are also Harbor Mist Gray. The trucks at one point were painted in an aluminum color, though due to high costs and high maintenance, this was also changed to harbor mist gray, right after the merger with WP and MP. Lettering and numbering are in Signal Red, with black outlines. Some locomotives (historically passenger locomotives, as well as most units from 2000 on) have white-outlined blue "wings" on the nose, on either side of the renowned shield featuring white lettering on a blue background and, below it, red and white vertical stripes. The lettering, reading "Union Pacific" (earlier, at times, "Union Pacific Railroad"), is in a proprietary font similar to Futura Bold. A zig zag design with the signal red line on the top half of the locomotive sides is affectionately known as the "lightning stripe", based on a design from later CNW locomotives. 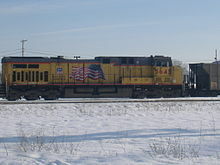 Beginning in early 2002, a number of units were repainted with a large, billowing American flag with the corporate motto "Building America" on the side, where the 'UNION PACIFIC' lettering is normally positioned. This paint scheme is known as "Building America," "Wings," or "Flags and Flares." The Armour Yellow livery was first introduced on the UP's M-10000 streamliner train in 1934, although Leaf Brown was used instead of Harbor Mist Grey. Passenger cars, cabooses, and other non-freight equipment have also been painted in a similar fashion. The steam locomotive paint schemes are unique in their own way. Up until the mid-1940s, all steam locomotives on UP were painted in a standard scheme: the smokebox and firebox were painted graphite and the rest was painted jet black; the lettering was usually aluminum. In the late 1940s, many passenger steam locomotives were repainted in a two-tone grey scheme to match the scheme applied to some coaching stock. These locomotives were painted light grey, with one dark gray strip running from front to rear alongside the running board and in the middle of the tender. This dark grey strip was outlined in yellow (originally aluminum), and all lettering inside the strip was yellow also. After 1952, these locomotives were repainted in the same basic black color scheme as the earlier freight locomotives. The grey passenger cars were repainted in the yellow scheme. While not technically a predecessor locomotive in the traditional sense, UP also rostered a single SD40-2 (3564) still in the 1970s paint scheme. Because patching varies in the degree to which it eliminates predecessor paint schemes, many patched units had unique designs, such UP 6361 (fully painted for UP, but only on one side). However, in 2017, Union Pacific decided to repaint all locomotives not in the current corporate colors. As of March 2018[update], only 41 locomotives remained unpainted. From the second half of 2005 to the summer of 2006, UP unveiled a new set of six EMD SD70ACe locomotives in "Heritage Colors," painted in schemes reminiscent of railroads acquired by the Union Pacific Corporation since the 1980s. The engine numbers match the year that the predecessor railroad became part of the Union Pacific system. The locomotives commemorate the Missouri Pacific with UP 1982, the Western Pacific with UP 1983, the Missouri-Kansas-Texas with UP 1988, the Chicago and North Western with UP 1995, the Southern Pacific with UP 1996, and the Denver and Rio Grande Western with UP 1989. In October 2005, UP unveiled SD70ACe 4141, commissioned in honor of George Bush. The locomotive has "George Bush 41" on the sides and its paint scheme resembles that of Air Force One. It was sent into storage in 2007, but returned in 2018 to power Bush's funeral train. On March 31, 2010, UP dedicated a specially painted GE ES44AC locomotive commemorating the centennial of the Boy Scouts of America. Although it retains the standard Armour Yellow and Harbor Mist colors, the unit has a large BSA 2010 logo on each side of the long hood, and the scouting logo low on the side of the cab. On September 28, 2010, UP dedicated a specially painted GE ES44AC locomotive, as a tribute to Susan G. Komen for the Cure. The unit is standard UP Armour Yellow and Harbor Mist colors, but has a large pink ribbon, the symbol for breast cancer awareness, on each side of the long hood. On October 19, 2017, Union Pacific unveiled SD70AH 1943, "The Spirit of the Union Pacific", which is painted in a scheme to honor the United States armed forces. UP also has an extensive collection of locomotives painted for Operation Lifesaver. As of October 2013, the Union Pacific had 8,185 locomotives on its active roster. The locomotive fleet consists of 43 different models and had an average age of 17.8 years. According to Union Pacific, this is the largest fleet of diesel-electric locomotives in the US. Union Pacific continues to use a small number of "heritage" steam locomotives and early streamlined diesel locomotives. This equipment is used on special charters as well as the Cheyenne Frontier Days Express special train. Union Pacific also maintains a single DDA40X locomotive, the most powerful diesel locomotive in the world. Union Pacific maintains an extensive fleet of low-emissions locomotives. The majority of these locomotives have been purchased via grants from the US federal government, via the Congestion Mitigation and Air Quality Improvement Program. Most are used in Los Angeles basin rail yards, to satisfy an air quality agreement with the local authorities. Alone among modern railroads, UP maintains a small fleet of historic locomotives for special trains and hire in its Cheyenne, Wyoming roundhouse. UP 4014 is a 4-8-8-4 Articulated type, Big Boy, freight steam locomotive. On July 23, 2013, it was announced that the UP was acquiring UP 4014 from The Southern California Chapter of The Railway and Locomotive Historical Society in Pomona, with the goal of restoring it to service. 4014 was moved from Pomona to the Union Pacific West Colton yard on January 26, 2014 and then to Cheyenne, Wyoming. Restoration to full operating condition is currently in progress, expected to be finished between 2017 and 2019. Volunteers and paid contractors are assisting the UP steam crew in the rebuild predominantly at the UP Steam Shop in Cheyenne. UP 844 is a 4-8-4 Northern type express passenger steam locomotive (class FEF-3). It was the last steam locomotive built for UP and has been in continuous service since its 1944 delivery. Many people know the engine as the No. 8444, since an extra '4' was added to its number in 1962 to distinguish it from a diesel numbered in the 800 series. It regained its rightful number in June 1989, after the diesel was retired and donated to the Nevada Southern Railroad Museum in Boulder City, Nevada. A mechanical failure occurred on June 24, 1999, in which the boiler tubes from the 1996 overhaul, being made of the wrong material, collapsed inside the boiler and put the steam locomotive out of commission. The UP steam crew successfully repaired it and returned it to service on November 10, 2004. It was rebuilt and returned to service in 2016. It is the only steam locomotive to never be officially retired from a North American Class I railroad. UP 3985 is a 4-6-6-4 Challenger class dual-service steam locomotive. It is the largest steam locomotive still in operation anywhere in the world. Withdrawn from service in 1962, it was stored in the UP roundhouse until 1975, when it was moved to the employees' parking lot outside the Cheyenne, Wyoming, depot until 1981 when a team of employee volunteers restored it to service. In 2007, it underwent repairs for service, and was back up and running in 2008 to continue its run. UP 3985 has been in storage since 2010, but may return to service once 4014's restoration is completed. UP 951, 949 and 963B are a trio of streamlined General Motors Electro-Motive Division E9 passenger locomotives built in 1955. They are used to haul the UP business cars and for charter specials. While externally they are 1955 vintage locomotives, the original twin 1200 hp 12-cylinder 567 series engines have been replaced with single EMD 16-645E 2000 hp (1.5 MW) engines (which were salvaged from wrecked GP38-2 locomotives) and the electrical and control equipment similarly upgraded, making them more modern locomotives under the skin. The set is made of two A units and one B unit. The B unit contains an HEP engine-generator set for powering passenger cars. The two A units were recently modified to eliminate the nose doors to increase safety in the event of collision. 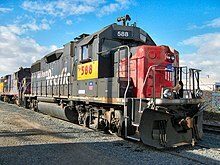 UP 6936 is an EMD DDA40X "Centennial" diesel-electric locomotive. These were the largest diesel locomotives ever built and were manufactured specifically for UP. Of the many DDA40X locomotives built, 6936 is the only one in service. The locomotive suffered major damages in 2000 as a result of a collision with a dump truck at a grade crossing in Livonia, Louisiana. After it was repaired a winged UP shield logo was applied to the front. It was also repainted in the current Lightning Bolt paint scheme and had a rooftop air conditioning unit installed. UP 5511 is a 2-10-2 Santa Fe-type steam locomotive built by Baldwin in 1923. She is the sole surviving member of her class and the only surviving UP 2-10-2 locomotive. This locomotive is very rarely ever heard of, because it was never donated for public display. This locomotive is reportedly in excellent condition. The only thing keeping it from being restored is that it would be limited to 40 mph (64 km/h) or lower due to its large cylinders and small drivers. As of August 2004, this locomotive is being offered for sale by UP. It is currently in storage at the roundhouse where the 844 & 3985 were repaired in Cheyenne, Wyoming. UP 1243 is a 4-6-0 steam locomotive, and is the oldest locomotive owned by UP. Built in 1890 and retired in 1957, it was at first stored in Rawlins, Wyoming. It was cosmetically restored in 1990 for public display, and toured with 844 as part of the Idaho and Wyoming Centennial train, being moved on a flat car. It was moved to Omaha, Nebraska in November 1996 and put on display at the Durham Western Heritage Museum. In addition there are a number of other locomotives kept in storage for possible future restoration. Rio Grande (DRGW) F9B 5763 is one of the units in storage, part of the Trio (A-B-B) of F9s that served on the Rio Grande in various Passenger Duty services (From the Denver Ski Train to the Zephyr Trains) until their retirement in 1996. Sister Units 5771 (F9A) and 5762 (F9B) were donated to the Colorado Railroad Museum. Chicago and North Western F7 No. 401, used for Chicago and North Western business trains, also was retained by UP. UP 838, a twin to 844, is stored in the Cheyenne roundhouse as a parts source, though as most of its usable parts have already been applied to 844, it is more likely to see use as a source of pattern parts for reproduction replacements. Reputedly, 838's boiler is in better condition than that of 844, due to 838 having not been in steam since retirement, compared to 844's relatively heavy use since 1960. Among the former tenants was Southern Pacific 1518 (the first production SD7 ex EMD demo 990), transferred to the Illinois Railway Museum after some time in storage in the UP shops. In addition to the historic fleet outlined above kept by UP itself, a large number of UP locomotives survive elsewhere. Many locomotives were donated to towns along the Union Pacific tracks, for instance, as well as locomotives donated to museums. UP 18, 26. From 1948 to 1970, UP operated a series of Gas turbine-electric locomotives. No other railroad in the world operated turbines on such a scale. At one point, UP claimed that the turbines hauled 10% of its freight. These were ultimately retired due to rising fuel costs. Two surviving GTELs can be seen on display; UP 18 is at the Illinois Railway Museum in Union, Illinois, and UP 26 is displayed at the Utah State Railroad Museum in Ogden, Utah. UP 119 – A 4-4-0 type. The original was scrapped, and thus technically does not count as a preserved engine. However, a full-scale, exact replica was built in 1979, and currently operates at the Golden Spike National Historic Site in Promontory, Utah. UP 737 – A 4-4-0 type that was in the collection of Steamtown National Historic Site, then moved to the Feather River Railroad Museum in Portola, California. Currently displayed at the Double-T Agricultural Museum in Stevinson, California. UP 3203 – A 4-6-2 type, donated to City of Portland, Oregon in January 1958. Originally Oregon Railway and Navigation Company No. 197, it was moved to the Brooklyn Roundhouse in 1996 and to the Oregon Rail Heritage Center in 2012, where it is now undergoing restoration. UP 3206 – A 4-6-2 type, originally on display at Highbridge Park in Spokane, Washington. Moved to Spokane Interstate Fairgrounds in 1978. UP 3977 is the only 4-6-6-4 Challenger class dual-service steam locomotive on static display. It is located in Cody Park in North Platte, Nebraska. UP 4018 – A Union Pacific Big Boy 4-8-8-4 articulated steam locomotive, originally on display at Texas State Fair Grounds, Dallas, Texas. Number 4018, currently residing at the Museum of the American Railroad in Frisco, TX, almost saw a return to operation in 1998 when a film director proposed restoring the locomotive for use in a movie. However, it has been 9 years since anything has been heard of this proposal, and it is considered to have been only a whim. UP 4466 – An 0-6-0 type built by Lima Locomotive Works in 1920, displayed at the California State Railroad Museum. It operated at the museum until 1999. UP 6900 Centennial series – Several of the huge DDA40X diesel-electric locomotives have been saved. Other than 6936 that UP maintains in its heritage fleet, none of the remaining Centennials operate. However, 6930 at the Illinois Railway Museum has operating cab controls, allowing it to couple to another locomotive and control it. Union Pacific owns a miniature train, sometimes called the "Pride of The Omaha Shops." It was constructed in 1956 in the Omaha shops. For many years, the train has been used in various events, including parades, employee Family Days and other civic events. Today, it makes about 50 appearances a year throughout Union Pacific's 23-state system and generally is booked up to three years in advance of special civic celebrations. Two UP AC4400CWs, including an ex-CNW unit, lead a typical empty coal train west at Belvidere, Nebraska in July 2015. According to UP's 2007 Annual Report to Investors, at the end of 2007 it had more than 50,000 employees, 8,721 locomotives, and 94,284 freight cars. In addition, it owns 6,950 different pieces of maintenance of way work equipment. At the end of 2007 the average age of UP's locomotive fleet was 14.8 years, the freight car fleet 28 years. UP ranked 141st on the Fortune 500 list of the largest United States corporations by revenue in 2018 and had 41,992 employees. As of 2018[update], Union Pacific does not provide regularly-scheduled intercity passenger services. A CNW-branded commuter service stops at Wilmette, IL in 1963. When Union Pacific merged with Chicago & Northwestern, it inherited C&NW's commuter rail services in the Chicago metropolitan area: Metra's UP/North, UP/Northwest, and UP/West lines, all of which operate from the Ogilvie Transportation Center (the former North Western Station–a name still used by many Chicago residents). In order to ensure uniformity across the Chicago area commuter rail system, trains are branded as Metra services and use Metra equipment. However, Union Pacific crews continue to operate the trains under a purchase-of-service agreement. On September 4, 2007 a Union Pacific train derailment split the small town of Sergeant Bluff, Iowa, in half. Around 16 cars, most of them carrying salt, derailed spilling its contents in mountainous, snow-like piles. The derailment caused an interruption in traffic for about two hours until city officials could clean up the mess. On June 24, 2012, three crew members were killed when two Union Pacific trains slammed into each other just east of Goodwell, about 300 miles northwest of Oklahoma City. The eastbound train passed a signal displaying stop on the main track and struck the westbound train in a siding about 1 mi (1.6 km) east of the meeting point. The crash triggered a diesel-fueled fireball that appeared to weld the locomotives together. On November 15, 2012, four United States military veterans in Midland, Texas died after their parade float was struck by a train. On May 25, 2013, in Chaffee, Missouri, a Union Pacific train collided with a BNSF train at a level junction, injuring 7, and causing damages exceeding $10 million. The accident caused a Missouri Route M overpass to partially collapse, and a post-accident fire was also reported. The resulting investigation concluded the engineer most likely fell asleep, due to sleep apnea. The uncontrolled train then violated four progressively more restrictive signals, before colliding with the BNSF train at roughly 40 mph (64 km/h). Three months later, Route M overpass reopened with a new design. On June 3, 2016, a 96-car oil train derailed in the Columbia River Gorge near Mosier, Oregon.This derailment had 11 cars derailed, at least one caught on fire, and 42,000 US gal (160 kL) of Bakken crude oil spilled, some of which into the Columbia River (10,000 US gal (38 kL) were eventually recovered). On June 28, 2004, a UP train collided with an idle BNSF train in a San Antonio suburb. 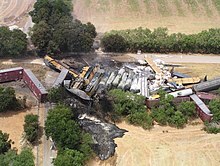 In the course of the derailment, a 90-ton tank car carrying liquified chlorine was punctured. As the chlorine vaporized, a toxic "yellow cloud" formed, killing three and causing 43 hospitalizations. The costs of cleanup and property damaged during the incident exceeded $7 million. Investigations of the Macdona incident revealed several serious safety lapses on the part of the Union Pacific and its employees, including employees not following the company's own safety rules. While the immediate cause of the derailment was the UP crew's "fatigue," chlorine tank cars had been improperly placed near the front of the train, a danger in the case of derailment. The Macdona incident was not the first derailment in the San Antonio area. Between May and November 1994, Union Pacific trains derailed five times, killing at least 4 people. Between June 2004 and March 2005, 10 trains derailed, killing as many people. In the aftermath of Macdona, the Federal Railroad Administration signed a compliance agreement with the railroad in which the railroad promised to rectify the "notable deficiencies" that regulators found. But the relative impunity UP seemed to exhibit regarding the derailment led to suggestions that the FRA was far "too cozy...to the railroads." In March 2005, Texas Governor Rick Perry supported a plan to reroute trains around large urban population centers in Texas, including San Antonio, but such a plan was purely voluntary and had no timetable associated. In Eugene, Oregon, the UP and the Oregon Department of Environmental Quality are jointly studying ground contamination at the railroad's yard originating with the Southern Pacific from over one hundred years ago, consisting mostly of petroleum hydrocarbons, industrial solvents, and metals. This has affected a nearby groundwater source. In 2007, Union Pacific Railroad partnered with the US EPA for an experimental method of reducing emissions of locomotive engine exhaust emissions. The experiment discovered that adding an experimental oxidation catalyst filtering canister to the diesel engine's exhaust manifold and using Ultra Low Sulfur diesel would together reduce particulate emissions by approximately 50 percent, unburned hydrocarbons by 38 percent and carbon monoxide by 82 percent. The company's Fuel Master program uses the expertise of locomotive engineers to save fuel. Engineers who save the most fuel are rewarded on a monthly basis. The program has saved the company millions of dollars, a significant amount of which has been returned to the engineers. In 2006, the program founder, Wayne Kennedy, received the John H. Chafee Environmental Award, and the program was recognized by Secretary of Transportation Norman Mineta. EMP, a domestic interline Intermodal freight transport partnership that provides shipping and logistics of containers, is owned by Union Pacific, along with Norfolk Southern Railroad and agent-owned partners Canadian National Railway, Canadian Pacific Railway, I&M Rail Link, Iowa Interstate Railroad, Wisconsin Central Ltd., and Kansas City Southern Railway. EMP's fleet of more than 35,000 domestic 53-foot containers and chassis traverse major cities throughout North America. The Union Pacific Railroad Museum is a former Carnegie Library in Council Bluffs, Iowa that now houses the Union Pacific legacy, one of the oldest corporate collections in the United States. The museum includes artifacts, photographs, and documents that trace the development of the first Union Pacific railroad and the American West. The museum's collection features weapons from the late 19th and 20th centuries, outlaw paraphernalia, a sampling of the immigrants' possessions, and a photograph collection comprising more than 500,000 images. ^ Includes subsidiaries Oregon Short Line Railroad, Oregon Railroad and Navigation Company, Los Angeles and Salt Lake Railroad, and St. Joseph and Grand Island Railway, but not jointly-owned subsidiaries Spokane International Railroad or Mount Hood Railroad. ^ Includes subsidiaries Oregon Short Line Railroad, Oregon Railroad and Navigation Company, Los Angeles and Salt Lake Railroad, and St. Joseph and Grand Island Railway. ^ Merger partner D&RGW elected not to join Amtrak and continued operating the Rio Grande Zephyr until 1983. ^ "Company Overview". Union Pacific Corporation. 31 December 2013. Retrieved 27 March 2014. ^ Union Pacific Railroad Company (April 2, 1868). Progress of the Union Pacific railroad west from Omaha, Nebraska, across the continent, making,: with its connections, an unbroken line from the Atlantic to the Pacific Ocean (Pamphlet ed.). 15 Vandewater Street, L. O.: C. A. Alvord. p. 5. This aid was given to two powerful companies, viz., to The Union Pacific Railroad Company, building from Omaha, on the Missouri river, West; and to The Central Pacific Railroad Company of California, building from Sacramento, East. Text taken from OCR; may be corrupt. ^ Strack, Don. "Union Pacific In Utah, 1868-1899". UtahRails.net. Retrieved 2018-09-07. ^ Solomon, Brian (2000). Union Pacific Railroad. Osceola, WI: MBI. p. 36. ISBN 978-0-7603-0756-4. ^ Crawford, Jay Boyd (1880). The Credit Mobilier of America: Its Origin and History. Boston: C. W. Calkins & Co.
^ Ripley, William Zebina (1915). Railroads: Finance and Organization. 4th Ave. & 30th St., New York, N.Y.: Longmans, Green, & Company. pp. 249–250. ^ "PNWC-NRHS". Oregon-Washington Railroad & Navigation Company. Retrieved 2018-09-07. ^ Brian Solomon (2000). Union Pacific Railroad. Voyageur Press. pp. 35–43. ISBN 9781610605595. ^ "Post-Construction". Union Pacific. Archived from the original on September 8, 2018. Retrieved September 7, 2018. ^ "Pacific Fruit Express Company Forms". Union Pacific. Retrieved 2018-09-07. ^ "Lucin Cutoff Opens". Union Pacific. Retrieved 2018-09-07. ^ "M-10000 Streamliner Debuts". Union Pacific. Retrieved 2018-09-07. See also in the sidebar: "By 1936, Union Pacific’s shiny new Streamliners had begun to attract passengers back to the railroad, but the Depression was keeping passenger counts low." ^ "Union Pacific Railroad invention still takes skiers to the top". Union Pacific Railroad. November 29, 2010. Retrieved June 9, 2017. ^ Lund, Morten (2000). "An extraordinary history of Sun Valley". Skiing Heritage Journal. pp. 20–25. ^ "UP Receives Its Last New Steam Locomotive". Union Pacific. Retrieved 2018-09-07. ^ 1980 mileage is from Moody's Transportation Manual (1981); the ICC's Transport Statistics says Union Pacific System operated 8,614 route-miles at year end 1980, but the 1979 issue says 9,315 route-miles and the 1981 says 9,096, so their 1980 figures look unlikely. ^ Arbona, Joe (August 22, 2007). "Union Pacific Begins Construction of $90 Million State-of-the-Art Intermodal Terminal in Southwest Bexar County". San Antonio, Texas: Union Pacific. Retrieved April 2, 2015. ^ Espinoza, Raquel (March 11, 2009). "Union Pacific Railroad Opens New San Antonio Intermodal Terminal". San Antonio, Texas: Union Pacific. Retrieved September 7, 2015. ^ "North America's Hump Yards". Trains. July 8, 2006. Archived from the original on December 4, 2008. Retrieved January 13, 2015. ^ Guss, Chris (March 2018). "Perfecting a unified look". Trains. 78 (3): 14 – via ProQuest. (Subscription required (help)). ^ "Denver & Rio Grande Western Colors Again Ride the Rails" (Press release). Union Pacific Railroad. June 19, 2006. Retrieved April 20, 2010. ^ "Union Pacific Railroad Unveils No. 2010 Boy Scouts of America Commemorative Locomotive" (Press release). Union Pacific Railroad. March 31, 2010. Retrieved April 20, 2010. ^ "Union Pacific Railroad Unveils Its Pink Ribbon Locomotive" (Press release). Union Pacific Railroad. September 28, 2010. Retrieved May 12, 2012. ^ "Train Pride". Union Pacific. Retrieved 2018-09-07. Today Union Pacific operates the largest diesel-electric fleet in the United States. ^ "UP: Steam". Union Pacific. Retrieved 2018-09-07. ^ "E-9 Streamliners". Union Pacific. Retrieved 2018-09-07. ^ "New Ultra-Low Emission Locomotive Goes to Work in Union Pacific's Los Angeles Basin Rail Yards". Union Pacific. Retrieved 2017-01-19. ^ Guss, Chris (August 2018). "Few flowers for gensets". Trains. 78 (8): 18–19 – via ProQuest. (Subscription required (help)). ^ Chappell, Gordon. "Union Pacific No. 4012". Steam Over Scranton: Special History Study, American Steam Locomotives. National Park Service. Retrieved March 13, 2012. ^ "RailPictures.Net Photo: UP 956 Union Pacific UP Mini-Train at Salt Lake City, Utah by James Belmont". www.railpictures.net. ^ Strack, Don. "UP's Miniature Train". UtahRails.net. ^ "Union Pacific". Fortune. Retrieved 2018-11-18. ^ "Metra History". Metra. August 10, 2018. Retrieved August 10, 2018. ^ Alicia Ebaugh, Journal staff writer. "Derailment cuts traffic in Sergeant Bluff". Sioux City Journal. Retrieved October 29, 2015. ^ "NTSB: Why didn't train wait before Oklahoma crash?". The Washington Times. June 26, 2012. Retrieved July 19, 2012. ^ "NTSB Launches Go-Team to Missouri to Investigate Collision Between Two Freight Trains That Partially Collapsed a Highway Overpass". National Transportation Safety Board. Retrieved 26 May 2013. ^ Hendricks, Christy. "NTSB investigating after train collision, overpass collapse in Scott County". KFVS12. Archived from the original on December 1, 2017. Retrieved May 26, 2013. ^ "Chlorine Rail Car Incident" (PDF). Aristatek. Retrieved April 18, 2010. ^ a b c Nordberg, Jenny; Bogdanich, Walt (November 17, 2004). "Regulators Plan to Step Up Union Pacific Safety Checks". The New York Times. ^ "NTSB – Remarks by Robert L. Sumwalt". National Transportation Safety Board. Retrieved April 19, 2010. ^ "Man Killed in Fifth Train Derailment in San Antonio Since May". The New York Times. November 11, 2004. Retrieved April 18, 2010. ^ a b c Bogdanich, Walt (March 19, 2005). "Texas Has Pact With Railroad To Move Lines". The New York Times. ^ "Train derailment leaves big mess". pro8news. Archived from the original on March 8, 2010. Retrieved April 18, 2010. ^ Davila, Vianna (4 November 2009). "UP train derails in Atascosa County". San Antonio Express News. Archived from the original on 4 September 2012. Retrieved April 18, 2010. ^ "Train derails near Schulenburg, spills chemical". The Victoria Advocate. Retrieved April 15, 2010. ^ "Schulenburg Train Derailment". United States Environmental Protection Agency. Retrieved April 18, 2010. ^ "Union Pacific Railyard Cleanup, Eugene". Oregon Department of Environmental Quality. Archived from the original on May 26, 2008. Retrieved March 29, 2009. ^ "Union Pacific Tests Exhaust Catalyst on Locomotives". Environmental Leader. January 18, 2007. Archived from the original on October 9, 2008. Retrieved May 8, 2008. ^ BioAge Media. "Green Car Congress: DOT Secretary Commends Union Pacifics Conservation Program, Says US Needs to Go on Energy Diet". greencarcongress.com. Retrieved October 29, 2015. ^ "Museum History". UPRR Museum. Retrieved 2018-09-07. ^ "U.P. History and Photos". Retrieved Apr 2, 2017. ^ "UPRR Museum". Retrieved Apr 2, 2017. Ambrose, Stephen E. (2000). Nothing Like It In The World; The men who built the Transcontinental Railroad 1863–1869. Simon & Schuster. ISBN 978-0-684-84609-5. Athearn, Robert G. (1971). Union Pacific Country (Reprinted ed.). Lincoln: University of Nebraska Press. ISBN 978-0803208582. – covers impact of the railroad on the region it served from the 1860s to the 1890s. Collins, Ryan Michael (2011). Irish Gandy Dancer : A Tale of Building the Transcontinental Railroad. Charleston, S.C.: Createspace. ISBN 9781452826318.
Cooper, Bruce C., ed. (2004). Riding the Transcontinental Rails : Overland Travel on the Pacific Railroad, 1865-1881. Philadelphia: Polyglot Press. ISBN 978-1-4115-9993-2. Galloway, John Debo (1989). 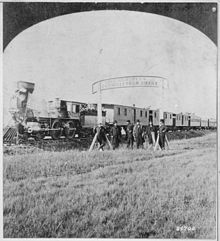 The first transcontinental railroad : Central Pacific, Union Pacific. New York: Dorset Press. ISBN 9780880294096. Kelly, John (2009). Union Pacific Railroad : passenger trains of the city fleet photo archive. Hudson, Wis.: Iconografix. ISBN 978-1-58388-236-8. Klein, Maury (2011). Union Pacific the reconfiguration : America's greatest railroad from 1969 to the present. New York: Oxford University Press. ISBN 9780199708581. Mitchell, Thomas Warner (August 1907). "The Growth of the Union Pacific and Its Financial Operations". The Quarterly Journal of Economics. 21 (4): 569–612. doi:10.2307/1883588. JSTOR 1883588. Perry, John D.; Wright, William Wierman; LeConte, John Lawrence (1868). Letter of John D. Perry, President of the Union Pacific Railway, Eastern ... Union Pacific Railway: Reports Showing the Necessity and Advantages of its Construction to the Pacific By Union Pacific Railway, Eastern Division, President. Philadelphia: Review Printing House. Retrieved February 19, 2011. Wikimedia Commons has media related to Union Pacific Railroad. The Union Pacific Railroad "Building America"